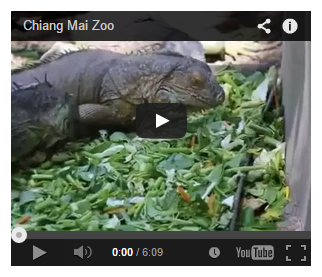 My Travel - Thailand - Chiang Mai. 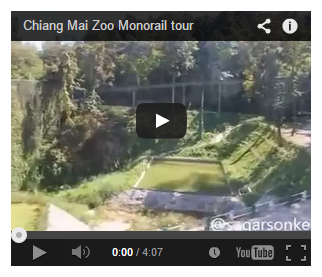 I travelled to Chiang Mai on the 26th of September 2014... solo! Parents were here only during the Tiger Kingdom weekend. This was the first time I stayed away from home fully independently for so long. P.S. I did NOT go there for hook-ups and I did not hookup with anybody. My idea of "fun" is very different. This ain't a justification, but writing it only, because people blatantly conjecture (and spread) things without knowing the person. I traveled from Bangkok to Chiang Mai by train, and returned by flight. NOTE: This is as per October 2014. Refer the official sources for latest information. ♦ www.airasia.com and www.nokair.com are the low-cost flights. Their fares are very low i.e. INR ~3,000 (~45 USD / ~1500 THB). You may luckily get a promotional fare of 790 THB (~INR 1,500 / ~24 USD) as well, which is amazingly low. These flights are from the Don Muang airport in Bangkok and they have luggage limitations. You need to pay for your luggage exceeding a particular limit (mentioned on their website). ♦An important tip: Pay online for your luggage beforehand. That'll save you a lot of money (the cost nearly doubles when you pay for your check-in luggage at the time of your flight). For example: My total luggage was at least 27 KGs. If I would've checked-in that luggage during my travel, I would've ended up paying 900 THB per 15 KGs. However, at least a week before my flight, I weighed and checked-in my luggage online @ 600 THB per (up to) 30 KGs. I also procured and printed out my boarding pass a week before my flight. That was something interesting. When one is new to things, it's very essential to research well, and I did that. I researched a lot around www.asia-discovery.com but although everyone who had provided comments on interacting with them were not very comprehensive, they were confident and positive. I went ahead and booked my trains to and from Bangkok and Chiang Mai through these agents. I did that at least a month in advance understanding that the seats could get full. The train was scheduled to depart at 6:10 pm. I reached the station at 5:10 pm and the train was ready. The train journey was very comfortable. Had a good sleep after an exhausting day travelling all the way from Pune to Bangkok Railway Station. If you arrive at the Suvarnabhumi Airport at Bangkok, catch the City Line (metro train) up to Makkasan (I paid 35 Baht). Get down at Makkasan station (platform is usually on the right side of the train) and walk towards the MRT (underground metro railway). 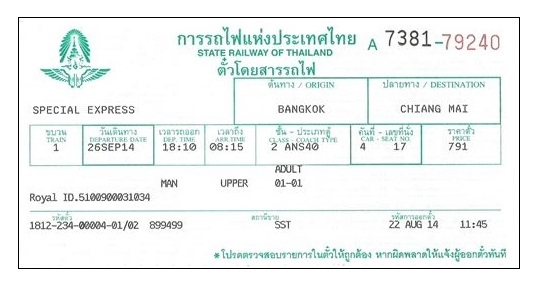 Buy the ticket up to Hua Lamphong (I paid 29 Baht) and you will reach there within 20 minutes. As soon as you walk out of the MRT, you will automatically step into Bangkok's Railway Station. 1. 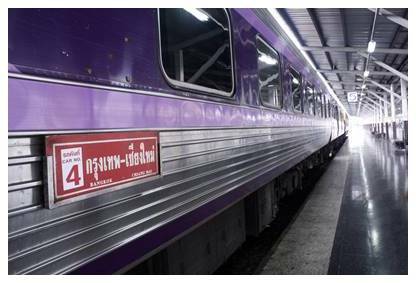 If you arrive at Bangkok at Peak Hours, the City Line (metro train) may be crowded, and you may have to keep sufficient buffer time before your Bangkok to Chiang Mai (or any other destination) train leaves. 2. Your luggage may be scanned at the railway station's entrance. ♥ I am mad and crazy about trains. That was one of my best train journeys in life, ever! Yes, you read it right. 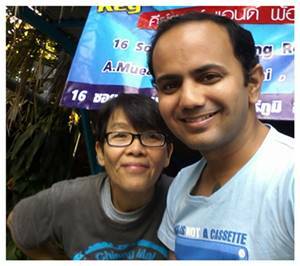 I stayed in Chiang Mai (Chok Dee Guesthouse) for 2 months (26-Sep to 26-Nov, 2014). So, if you were here around the Oct-Nov 2014 timeframe and you saw an Indian guy around, that was me. Had a very comfortable stay. Didn't feel like going back. Placed in the old city, Chork Dee or Chok Dee Guesthouse, according to me, is at an excellent location. If I would not have stayed here, I would certainly have missed out on the core essence of the city. Many places to visit around at walkable distance, a huge vegetables market called Somphet (which is what this area is popularly known as). I booked this guesthouse through www.booking.com. The amount was not debited 3 days before I arrival, so I was a bit concerned about whether my booking was confirmed or not. However, it was after my arrival that I discovered that Leo (the owner) preferred to receive the amount in-person and not online. The nicer thing was that I was asked to pay later, and there was no hurry. It was very comforting. He welcomed me very warmly. I remember he helped me by keeping my huge bag upstairs. 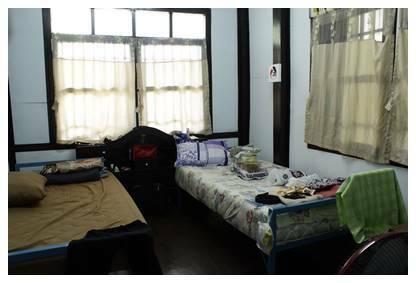 It's a basic place, with single and double rooms (double rooms with either two single beds or one double bed). Rooms are completely wooden, from ceilings to walls to floors. All the rooms come with a fan (except their other branch at a minute's walking distance, where there is A.C. but the rooms there are smaller). That's pretty much it. I took a double room for two reasons. My mum was going to accompany me initially, but our plans changed. I kept the double room for myself, because I need space around me (despite being a 'small man' as Thais call me). Size matters to me, when it comes to magnificence in life. The room was clean, and decently huge. The only con was that whenever someone walked up the corridor (with heavy feet) or slammed their room's door (which people do very often) or talked loudly in their rooms or in the sitting area outside (which excited tourists are bound to do), especially after 1 am in the night, I used to experience slight disturbance, and it was uncomfortable especially when I had teaching practices the next day. 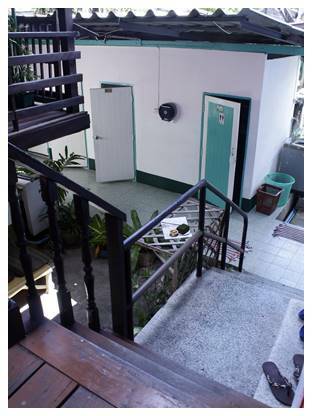 Shared bathrooms and toilet were very very well-maintained, and cleaned. One is not allowed to wash clothes in the bathroom. They have washing machines, or there are quite a few laundry shops nearby, where I got my clothes washed, dried, and ironed (at prices ranging from 40 to 80 baht) once or twice. Wi-Fi was super-fast, and glitches, if any, were from the Service Provider (True-move), but very rare. 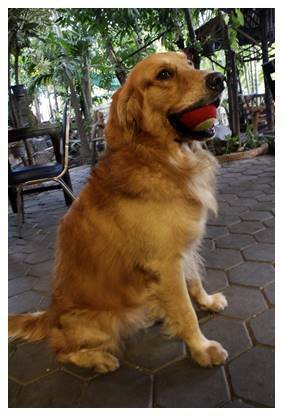 There is a sitting area outside, where one can sit, speak with others, or just enjoy squirrels, fishes, and most important, Beer, the adorable dog. There were so many times when he followed me all around the place, and it was such a lovely experience. The fish pond outside is for people like me who can sit besides it for hours doing nothing. The lady at the reception is very sweet, helpful, and funny. We had a great laugh, cracked lots of jokes, and had a great time. So are Leo and Jasmine (the owners). Jasmine is very actively helpful as well. 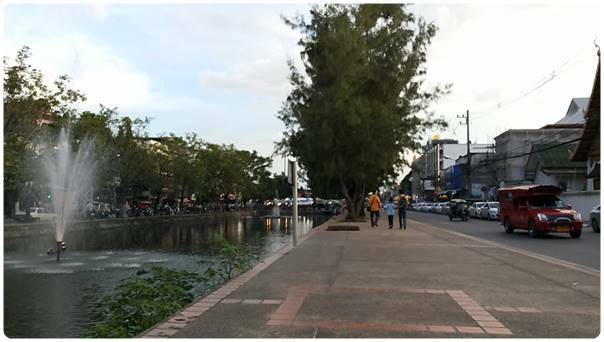 The area is known as Somphet, which is essentially the Soi (lane) 6 at the Moon Muang road. 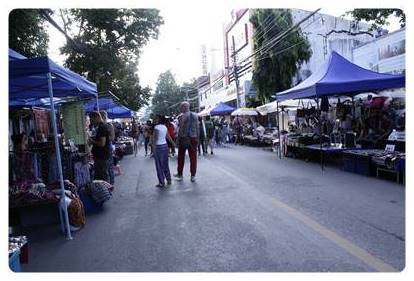 The market which is at the Moon Muang road (right at the beginning of the Soi) is known as Somphet Market, and that's what you tell the Tuk-tuk or Songthaew or Taxi drivers. Somphet Market, 3 Kings Monument, many Wats (temples), Sunday Market, Tha Pae Gate, many restaurants, Warorot Market, Ping river, and many other places at walkable distance. I will be back, as I've told Leo. In fact, I've kept some of my extra stuff in their store room, for me to use it the next time I'll be here. This was my primary purpose of visiting Chiang Mai. Due to a communication gap, I ended up in having a rough experience after the course. However, I would like to forget the negative part, just because the overall positive experience (in Chiang Mai as a whole) was beyond what I can put in words. We all are human beings, and I understand that not everyone are perfectionists like me! Taking this 120 Hours Course was super-fun. Every single minute was precious and is memorable. I don't remember exactly, but they have prices per tiger size, and packages too. It's above 1,000 Baht. I went there with my parents on 18-Oct-2014. We took a tuk-tuk that charged us 150 baht as a roundtrip fare. I think, one way to save tigers is to visit such places. These tigers were very active, playful, and scary too. I do not know whether they were drugged, but I do not think they were, and I cannot comment on that, but they were certainly well-maintained and taken care of. Drugged tigers don't look that healthy (as the people there commented). They were aggressive, and one is not allowed to touch their head or paws - for obvious reasons. I had a superb time here as well. We did hire a photographer to click my pictures (300 Baht for photos on a CD). He did a great job. It's a must visit, especially if you love tigers. There are other tigers too kept in their cages that can only be seen (but not entered into). There was a lion, white tiger, and a couple of other birds and animals too. It's roughly 2 KMs from Somphet Market (Moon Muang road Soi 6), and I went walking. On the way back, took a Songthaew @ 20 Baht. Hotel Shangri La, Chiang Mai, is the landmark. Just after the huge hotel, there's the museum's huge building that you cannot miss. There are various themes too, like Alladin, Mummy, Waterfalls, etc. that are enjoyable. One tip is to take pictures smartly, and make them look 3D. At some paintings, there are markings for the photographer's position, and that's very helpful. It took me about an hour to go around. If I weren't alone, I would've definitely spent a lot more time hanging around there. 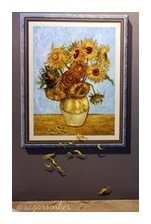 It's a must one-time visit, especially if you love art. I was initially very apprehensive from most of the 'ungood' reviews I read on TripAdvisor, but one day I suddenly woke up and felt like going. Went there (solo) on 11-Nov-2014 and had a great time. 290 Baht. They had some offer running that day. GETTING THERE: Songthaew (red trucks) generally take 30-40 Baht from the old city to the zoo. Magnificent, large, and very well-maintained. Very 'naturesque'. Animals have huge spaces (rightly) and they're placed in groups, far from one another. You can find the Zoo's map here (coming soon). The Aquarium is ~1 KM from the main entrance, and there are open Shuttle Buses or Mini Vans (100 meters from the entrance) that take you there. My ticket covered one way free drop to the Aquarium by the van, and that's where I went first. Enjoyed it. I then bought a 100 Baht Full Day Shuttle Bus ticket around the zoo. You can hop on and hop off any number of times from anywhere around the zoo. My 100 Baht Shuttle Ticket covered the Monorail as well. The ride was fun. Slower the better. Spotted many other animals like Giraffes, Lions, and Zebras. It was an hour's ride, and that's when I was pretty exhausted, so I wrapped up my visit. Saw the Orangutan from very close (he was busy breaking a coconut and eating it). Got some very nice close-ups. Then saw a couple of monkeys and reptiles (chameleons, crocodiles, snakes). Without reading a sign, I went inside a lane, and spotted Peacocks (Indian Peafowls) out in the open. There were three of them, at a distance of 4 feet from me. That was the best part of my day. 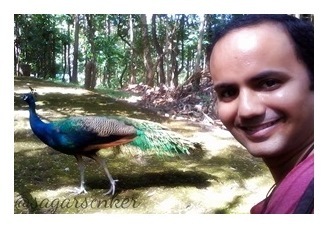 You don't get selfies with Peacocks in the frame everyday. Then saw many more animals, and went to the monorail. It took me about 3 hours to go around, and I believe this time is less. If you go in groups, you can easily spend an entire day around. It's fun. 1,600 Baht (their promotional price). It's about an hour's drive from the city. They pick you up from and drop you at your hotel / guesthouse. Thoroughly thoroughly thoroughly enjoyed myself. I used to watch Fear Factor and Khatron Ke Khiladi on television, and always wanted to perform those kinds of stunts under safe conditions, and part of my desire was partially fulfilled there. The longest one was 450 meters, while the highest one was 100 meters. There were also a couple of bridges, a chair to slide down, and some fun drops. The activity itself took about 3 hours. At the end, they gave a FREE T-shirt. They also served lunch. They did have a vegetarian dish. 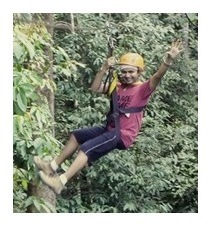 Would love to do such an activity again. One important tip is to charge your camera's battery full and empty your memory card, so that you can take lots of videos and photos of the moments. If you're lucky like me, you will have a wonderful group as well. They do have lockers at their base camp to keep your bags and stuff safe, while you are allowed to carry only camera with you to the zipline. I'm a diehard shopaholic. If I like something and can afford it, it has to be mine! Some of my best experiences in Chiang Mai were my shopping experiences. Central Kad Suan Kaew - The first place I actually shopped in. Accessible by a Songthaew @ 20 Baht, it's on the North West of the city. A huge variety of clothes, those of International Brand as well as Thailand, they had a lot of offers running too. Of all that I bought there, the most prominent purchase was Lee Cooper's shorts & shirt. Warorot Market - At a walking distance (~1.6 kms) from the Old City, this is another Shopper's Paradise. There's more variety for women than there is for men, but there are a lot of unisexual items too. A lot of gift items, souvenirs, cloth, clothes, bags, etc. This is a mini version of the Bangkok's Chatuchak Market. Just outside the Warorot Market, we (my mum and I) bought some tupperware items of very good quality at not a very high price. Central Airport Plaza - This one is a gigantic and a superb shopping mall near the Chiang Mai Airport. 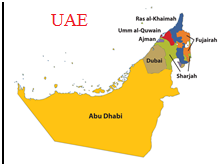 I went there on Monday, 17-Nov-2014 after extending my VISA at the Immigration Office, which is near the Airport as well. This shopping experience gets added to one of my best moments in life. I was very happy, relaxed, and flying. I shopped from Robinson's and another store that I forgot the name of. This was my biggest (money-wise and number of items-wise) shopping in Chiang Mai. After I finished shopping, I was a bit hungry, and I spotted a Pizza Hut on its top floor. Entered into it to discover that they had a Vegetarian Pizza. Ordered a Personal Pizza for 148 Baht (flat) with a replenishable soft drink @ 50 Baht. It was just perfect for that moment and the amount of hunger. That was just a perfect moment. I was towards the end of my Chiang Mai trip, and every moment was just very special for me. Sunday Market - Another gigantic shopping street that opens up on Sundays. I shopped a lot from there as well. Online Shopping - I have to shop online at least once in a month or two, otherwise I will die! Shopped on www.zalora.com during my stay in Chiang Mai, and got the goods delivered to my guesthouse's address. This website does not ship to or is available in India, so I couldn't stop myself from shopping. Vegetarian Food was NOT a problem in Chiang Mai. It is a heaven for vegetarians, as they say. I ate a variety of Vegetarian (eggless) dishes during my stay, and thoroughly enjoyed. 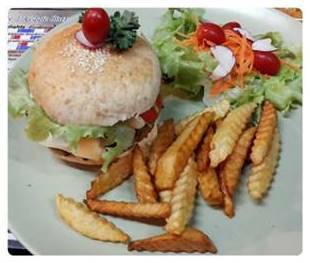 I have to mention about this Vegetarian Burger that I had here. The restaurant closed after I ate this burger thrice (probably shifted to another city Pai), however, this is one of the best burgers I've ever had in my life, and I don't know if I'll ever get to eat it again! There are many Vegetarian Restaurants in the City, and some Thai Vegetarian items are really good. I got my Tourist VISA extended by 30 days very conveniently at the Chiang Mai Immigration Office. I reached there around 9:30 am on a Monday morning, when it was too crowded. Had to wait for ~2.5 hours until my token number was displayed, when I submitted the form and my passport at Counter # 1 (Tourist VISA extension counter), and paid the fees of 1,900 Baht. I then waited for another half an hour until my name was announced for collecting the passport with the VISA extended. Luckily, my token number was 038, and they announced around 10:30 am that the token numbers 050 onwards would be processed after 1 pm that day. So, going early is a good idea. I had no idea about this, and on Googling a bit, the blog 'How To Extend Your Thai Tourist Visa in Chiang Mai' was the most helpful. I stayed in Chiang Mai for 2 full months, and bought a lot of things during those days. At one point, I realized that it would be too difficult for me to carry all of that stuff back home. So, I looked up the Internet, and found that it would be a very convenient idea to send some things in a box via Thai Post. These are two very good travel guides on Chiang Mai. Very comprehensive and informative.